After a week of unseasonably rainy weather and high water levels coupled with higher rates of generation, it was time to put my Brown Trout theory into practice now that the levels were back in our favor. Bull Shoals appears to be sticking with their “minimum flow” routine and allowing the extra water to flush down the river is maintaining cooler water temperatures and good daytime wading conditions. The water had its normal crystal clarity and seemed to be holding at 64 degrees even on a warm 85 degree August afternoon. We arrived at Rim Shoals to find the extra water providing some really good fishing on a few of the riffles that are normally rather shallow with no flow. The fish seem to hold in these areas while the water level provides easy access for them although they will migrate away as the level drops. August doesn’t provide much in the way of aquatic insect hatches although the terrestrials come into their own at this time of year so that particular box was to the front of my pack. I had spotted tan grasshoppers along the bank in addition to black crickets and large black wood ants. Some of the ants were probably a size 16 and maybe a little larger. Tying on my tan foam hopper pattern I worked one nice run which produced about ten fish to hand and about the same amount of misses. I tried slower sets and faster sets although neither appeared to produce better results and I finally resorted to bending the hook over to give an offset gape which seemed to improve matters. None of the fish were particularly large in this section and I contained the urge to head for the section where I suspected the bigger fish to be holding; although not for long! Once in this area I slowly worked my way upstream, landing my fly in every likely spot without any initial success. I worked one particular area quite hard without any takes and then as I moved up through it, a huge Brown shot from under a log and almost went between my legs. It had been completely hidden until I spooked it and was one of about four big fish that I disturbed from under cover as I moved through sections. No doubt with some sort of large sinking fly I might have had a chance with these fish, but you should know by now that I hardly ever carry any! Just a little further upstream I landed the fly in the shadow of an overhanging tree; as the concentric ripples of its landing moved outwards, a huge wake moved towards it and the unmistakably large jaw of a Brown Trout broke surface to engulfed the fly. The next part of the game plan was to guide the fish away from the mass of tree trunks, limbs, weed and other structure designed to take a tippet beyond it breaking point. This fish didn’t resist my efforts and moved into clearer water without too much problem and where I could apply steady pressure to bring him to hand. I did receive a couple of reminders that one can’t “horse” these fish in, and my 4x leader probably ended up slightly longer than when I first tied it on. Soon I had the results of my labors in the net and it proved to be one of the most beautifully colored Browns I have so far caught in the White River. I didn’t have my usual landing net which is marked for length measurement, so I “guesstimated” the Brown’s length using my fly rod. It was well over 20 inches and probably closer to 23 making it the best fish I have caught on a dry fly in that water. This fish turned out to be the fish of the day although I did miss one later on that might have been in the same range; and I missed it because I didn’t practice what I preach, DON’T walk and cast at the same time! Further upstream I alternated between hopper and an ant patterns with reasonable success although no big heads appeared as I worked the bank closer to the top of the main riffle. “How many 20 inch fish do you expect to catch in a year”? 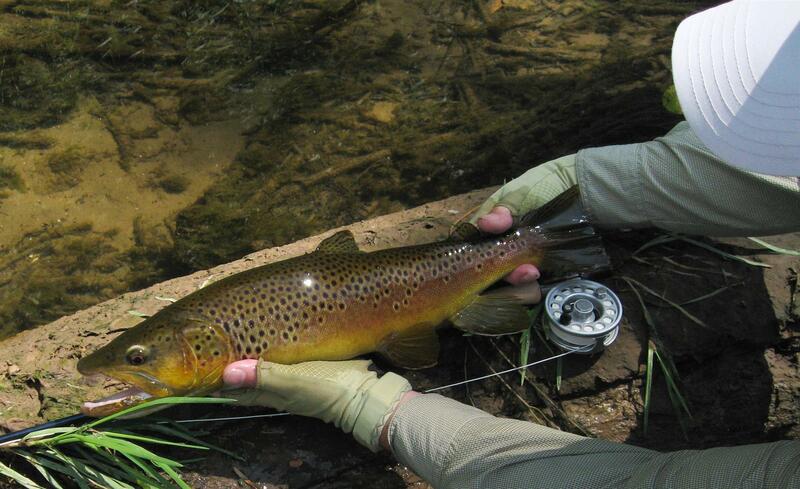 This entry was posted in Fly Fishing, Stream Report and tagged arkansas, brown trout, fly casting, foam hopper, rim shoals, white river. Bookmark the permalink. What excatly are you doing to the hook to get this result?